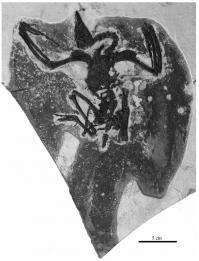 Based on a well-preserved specimen from the Lower Cretaceous Jiufotang Formation in Jianchang, western Liaoning, China, Paleontologists of Institute of Vertebrate Paleontology and Paleoanthropology (IVPP), Chinese Academy of Sciences reported a new species of basal ornithurine bird, Schizooura lii gen. et sp. nov., in the latest issue of Vertebrata PalAsiatic 2012(1), helping better understand the early diversification of ornithurines and revealing new information regarding the complex pattern of character evolution among early birds. The specimen preserves a nearly perfectly articulated skull that indicates the species was beaked and preserves details of the skull anatomy such as the premaxilla-frontal articulation. Schizooura preserves numerous characters that align it with the ornithurines. It also preserves features that suggest the new taxon is primitive within this clade. Scientists observed a unique suite of characters in this new specimen that differentiate it from other known taxa, including several features previously unreported in Early Cretaceous ornithurines, such as a V-shaped furcula with a short hypocleidium, a rostrocaudally elongate unperforated sternum with deep caudal notches absent, and a deltopectoral crest that extends for half the length of the humerus. Phylogenetic analysis indicates that it is more derived than Jianchangornis and Archaeorhynchus, but more basal than all other known Jehol ornithurines. Schizooura preserves several new features and morphological combinations, revealing new information on the morphology of basal ornithurines. The most notable feature of this new specimen is the preservation of a feathered tail morphology previously unknown among Mesozoic birds. It is the second tail morphology recognized among early ornithurines, which are only known with fan-shaped tails. Schizooura owns a forked tail composed of elongate rectrices medially separated by a deep notch. This tail feather morphology in modern birds will decrease aerodynamic efficiency but increase chance of sexual reproduction, as compared to the fan-shaped tail. Thus, this discovery suggests that this tradeoff convergently evolved in basal members of Ornithurae, and is consistent with the wooded environment inferred for the Jehol, said the first author of the study ZHOU Shuang, a paleontologist graduate student of the IVPP. Several features suggests that Schizooura was cursorial. It appears adapted for the ground, and possibly lived a terrestrial or near lakeshore environment, like most other basal ornithurines.